Henrik Sedin's Banner Year: Vancouver's Swedish centreman had one of the more successful seasons a player could ever hope for in 2010, as he and his twin brother Daniel once again ran rampant over opposing teams, piling up points in the process. Henrik led the entire NHL in scoring during the 2009-10 season, with an Art Ross Trophy-winning 112 points, and he was also awarded the Hart Trophy as the league's Most Valuable Player. Henrik was also named team captain of the Canucks in a pre-game ceremony during the team's home opener this past October. Steven Stamkos & Sidney Crosby Tie For Rocket Richard Trophy: Going back to the beginning of last season, it would be hard to imagine any one picking these two to eventually lead the NHL in goal-scoring by seasons-end, with Tampa Bay's Stamkos being so young and Pittsburgh's Crosby's reputation as being primarily a playmaker. Yet both broke the hallowed 50-goal plateau, tying one another for top spot on the goal-scoring list with 51 apiece. Stamkos more than doubled his goal output from his rookie year, going from 23 to 51 in just his second pro season. Crosby, whose previous NHL season-high was 39 goals in his rookie year, had 49 goals going into the Penguins' final game of the regular season against the Islanders, but scored twice in the game to push him into a tie and a share of the Rocket Richard with Stamkos. Fenway Park Winter Classic: Following in the footsteps of Wrigley Field in Chicago the year before, the NHL's annual Winter Classic was hosted by another of baseball's most classic parks for the New Year's Day game in 2010. Fenway Park, home of the Boston Red Sox, welcomed the hometown Bruins and the Philadelphia Flyers for a game outdoors that continued to raise the bar for the popular event. Marco Sturm scored the game-winning goal for Boston at the 1:57 mark of overtime, in a contest that would foreshadow an epic playoff match-up between the two teams down the road in the spring of 2010. Phoenix Coyotes Make Playoffs After Summer of Uncertainty: After an offseason of bankruptcy hearings and a difficult performance for the team in 2009, not much was expected of the Phoenix Coyotes heading into the 2009-10 season. When the puck dropped however, Phoenix found a recipe for success that maximized the efforts of a solid roster of players and eventually earned Ilya Bryzgalov a nomination for the Vezina Trophy as the league's best goaltender. The Coyotes won 50 games for the first time in franchise history, while their 107 points was also a team-record, earning them their first playoff berth since 2002. 24/7 Road to the Winter Classic Series Debuts on HBO: Following an excellent documentary done by the network chronicling the Broad Street Bully-era Philadelphia Flyers, HBO continued its interest in hockey by having its cameras gain unprecedented access to the Capitals and Penguins for a behind the scenes look at both teams in the weeks leading up to their Winter Classic game at Heinz Field in Pittsburgh. Offering an unscripted and uncensored look into the lives of hockey players, the 24/7 series (which has followed boxers preparing for fights and NFL training camps) gives hockey fans a unique and compelling glimpse into what being in the NHL is like. Crosby Goes Streaking for 25 Games: In what many are describing as him pulling away from the rest of the pack as the NHL's best player, Sidney Crosby went on 25-game point scoring streak, the longest since the 2004-05 owners lockout. In a span that lasted almost two full months, Crosby scored 26 goals during the streak, while adding 23 assists, for a mind-blowing 49 points in those 25 games, earning him a 13-point cushion over Steven Stamkos in the league's scoring race at the time of publishing this article. After being held off the board by the Islanders on December 29th, Crosby looks to ignite a new streak on New Years Day at the Winter Classic. Alex Ovechkin Wins 3rd Straight MOP Award: Joining Guy Lafleur and Wayne Gretzky, Alex Ovechkin became only the third player in the history of the Pearson/Ted Lindsay Award to be recognized by the members of the NHLPA as the league's Most Outstanding Player for three consecutive years. Ovechkin also scored 50 goals for the third consecutive year as he led the Capitals to a President's Trophy win as the team with the best regular-season record. The trophy was presented to Ovechkin in Las Vegas at the NHL Awards by Mr. Lindsay himself, the former Red Wing & Blackhawks great who helped organize the NHLPA during his playing days. 2010 was the first year that Lindsay's name was adorned on the award, having had it renamed in his honour in earlier in the year. Olympic Hockey Tournament Ends in Compelling Fashion: 2010 will forever be remembered as an incredible Olympic year, with the 17 day athletic feastival leaving people all around the world in awe of the ability and drive of a plethora of international athletes. For Canadians and, indeed hockey fans the world over, the culminating moment of the Vancouver Olympics will always be at the seven minute and forty second mark of overtime in the gold medal game between Canada and the United States. After a late Zach Parise goal brought the Americans level with the home nation Canadian squad and sent the match into extra time. 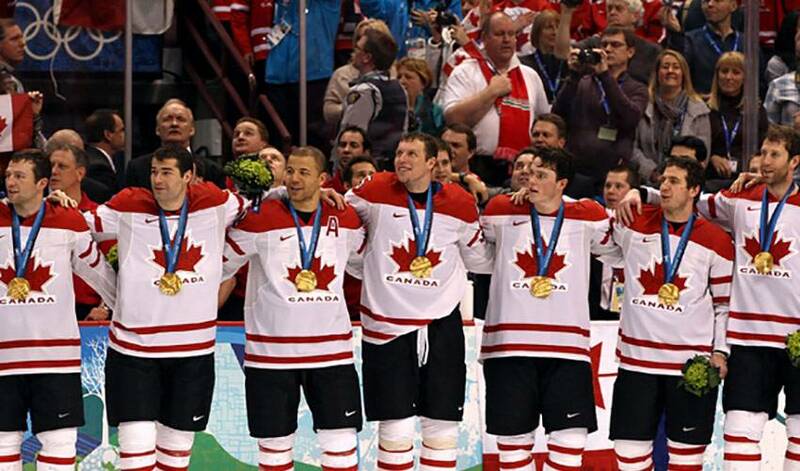 Cementing his place in Canadian lore, Sidney Crosby (who else would it be in 2010?) took a pass from Jarome Iginla and slipped a quick shot between the pads of Ryan Miller for a game-winning goal that capped a competitive and compelling tournament that anyone could have ever asked for., one that saw NHLPA members play starring roles for their home nations and participate in the Olympic experience in the beautiful city of Vancouver. Flyers Come Back From the Playoff Dead Against Boston: At this time a year ago, things were looking bleak for the Philadelphia Flyers. They experienced such a skid in November and December that their head coach was relieved of his job and the resulting hole they dug for themselves forced the team to need a shootout win during the last game of the season just to make the playoffs. Following a series win over the New Jersey Devils in the first-round, the Flyers matched-up with the Bruins in the Eastern Conference Semi-Finals. The Bruins raced out to a 3-0 series lead and it looked like they would be waiting to face the winner of the Pittsburgh-Montreal series. But the Flyers refused to cooperate, clawing their way back into the series, one win at a time. Even with a 3-0 lead at home for Boston in Game 7, the Flyers summoned one last miracle, scoring the next four goals to join the 1941-42 Toronto Maple Leafs and 1974-75 New York Islanders as the only NHL teams to win a playoff series after being down three games to none. Chicago Wins First Stanley Cup Since '61: In a highly entertaining Stanley Cup Final, the Chicago Blackhawks ended what had been the league's longest championship drought, by beating the Flyers in six games to win the franchise's first Stanley Cup in 49 years. Patrick Kane, who months earlier saw Sidney Crosby score to defeat him and his Team USA teammates at the Olympics, scored an eerily similar goal to win the Stanley Cup, putting a shot by Philadelphia's Michael Leighton at 4:06 of overtime, stunning the Flyer faithful. Jonathan Toews capped an incredible season by winning the Conn Smythe Trophy as playoff MVP, to go along with the Cup victory and the gold medal he won as part of the Canadian Olympic team, alongside Chicago teammates Brent Seabrook and eventual Norris Trophy-winner Duncan Keith.